Bhama Vijayam (1967) A middle-class joint family is living happily run by the responsible father Ethiraj (T. S. Balaiah), a retired headmaster. He has three sons -- Maheshwaran (Major Sundarrajan), Raman (R. Muthuraman), and Krishnan (Nagesh). Maheswaran is a Hindi professor, married to Parvathy (Sowcar Janaki) and they have 5 children. Raman, a clerk in high-court is married to Seetha (Kanchana) and they have two children. 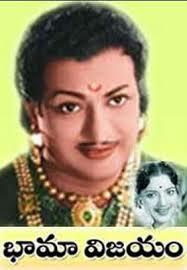 Krishnan, a medical representative is married to Rukmani (Jayanthi). Meanwhile, a popular film actress Bama moves into the bungalow next to their house. The three daughters-in-law & the sons try to make friends with her. Bama is very polite, and accepts their invitation to come to their house. The three ladies in the house start making fuss about the condition of their house, saying that they do not have enough facilities in their house to show to Bama that there are well-off. The husbands try to convince them but they force their husbands to agree to whatever they ask. Eventually the men give in and start buying things for their own houses. What happens next?.